At a price of $2.99, the fact that BATWOMAN #0 is only 16 pages long, ending right at the halfway mark of the issue (albeit without any ads until after the main story) , may seem like a ripoff. But to be honest? I never even noticed. 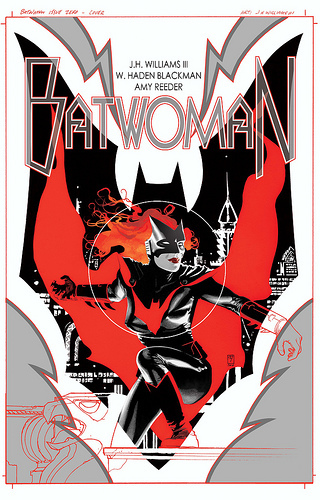 BATWOMAN #0 is a sort of primer for the ongoing BATWOMAN series debuting in February. It's written by JH Williams III and W. Haden Blackman, and drawn by Williams and Amy Reeder. The story consists of two parallel narratives: one of Batman (the newly returned Bruce Wayne) observing Batwoman, and another of Bruce Wayne observing Batwoman in her civilian identity, Kate Kane. Although I'm unsure as to how the writing was divided up (I'm guessing that Williams and Blackman co-plotted the story, Williams laid it out, and then Blackman scripted it, but I could be very, very wrong), but the art chores were divided in a pretty straightforward manner: Williams draws the Batwoman sequences and Reeder draws the Kate sequences. On the ongoing series, Williams and Reeder will be trading story arcs (with Williams kicking it off), so this was a good way to show us how Reeder's art is going to stack up to Williams', who is the best artist working in the business today. And Reeder matches him, I think, step for step, although I'm fairly certain Williams is doing the bulk of the design work. Since Batman is the world's greatest detective, he actually discerns everything on his own that we need to know when the series starts in February — all without ever even speaking to Kate. From Kate's sexual orientation to her current relationship with her father, Batman figures it out right away and tells a new reader everything he or she needs to know. And that's pretty much the story. It's a primer on Kate Kane, Batwoman, meant to set up the new series and catch you up. If you've already read the BATWOMAN: ELEGY hardcover, you already know all of this, and so, the story isn't really a big draw. But the art - my GOD, the art. At this point, I would buy a book of JH Williams III did even one page in it, because I simply don't want to miss a single page of innovation from that incredible mind. The Eisner Award–winner knows how to structure his art to fully utilize the skills of that other Eisner Award–winner on the team, colorist Dave Stewart. From the shiny colors of Batwoman's costume to whole panels of nothing but red to emphasize action, the color truly sets this book apart from anything else on the market. Meanwhile, Reeder handles the more human sequences, and there's a particular sequence with Kate at the library where Reeder shows off great skill in terms of human expression. All the while, these two parallel narratives are told separately until they finally converge artistically in one unbelievably dynamic sequence. Which I will not spoil for you. Go read the comic to be amazed at the unbelievable artwork. If you're one of those "I want to have a great captivating story," this issue might seem redundant. If you're one of those "I buy it for the art" people, this is a must-buy. But one thing is for sure: if this issue is any indication of how the ongoing's going to be like, then keep an eye out for BATWOMAN #1 in February 2011. In my estimation, it's going to be the series to watch in 2011. Mark my words.